The international tournament stage has been set for another special weekend of hockey in Hong Kong. 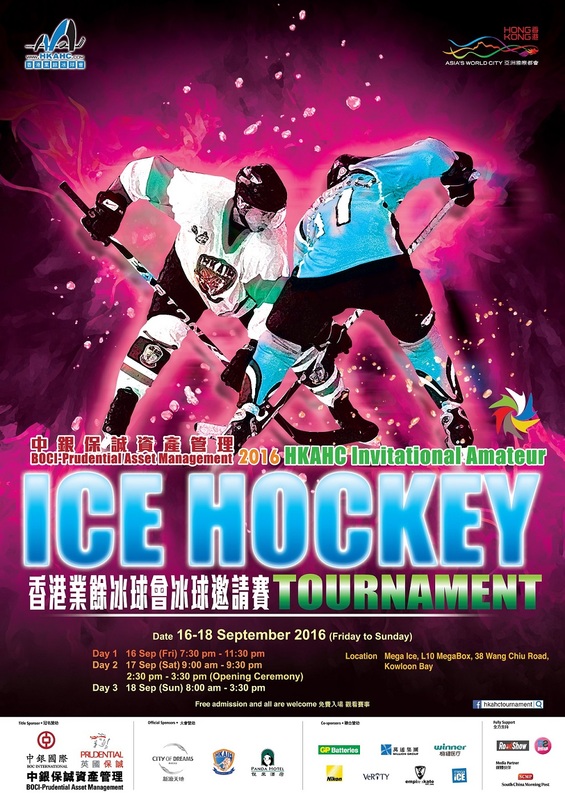 The 14th annual BOCI-Prudential Asset Management 2016 HKAHC Invitational Ice Hockey Tournament begins Friday, September 16th and will feature more countries and more young players than ever before. The field of nine teams have been selected and are set to compete in the weekend event. Last year’s Gold Cup Division Champions Philippines return to the tournament, and will look to defend their title. They were victorious over Mitsubishi (Japan) who will also return to avenge last year’s loss in the finals. Also in last year’s Gold Cup grouping were the United Arab Emirates, who had a strong showing in their first year in the competition, and we welcome them back for a second year. Last year’s Silver Plate Division Champion Chinese Taipei also return to the tournament, who took the Gold Cup Championship the previous year. They were victorious over Capitals (Mongolia) who will make their second straight appearance in the tournament. Long time participants HAMA Club (Japan) were also in the Silver Plate Division and will look to make a stronger showing this year. Bauhinia Division Champions Macau will be back for another year, as they look to defend their title in this division. The runner up in this division was Qatar however they are unable to participate this year, which opens the door for newcomer Oman to the tournament. It will be interesting to see what kind of impact the new team can make on this year’s tournament field. The home squad of the HKAHC is also in the mix and they are looking stronger than ever. Principal Standard League Coach Barry Beck will be head coach for this team and will add assistant coach Robert Kang to the staff. With a stronger line up and additions behind the bench, they are looking to reach a higher level than in the past. With this stronger and diverse tournament field, it is any teams’ race to the Gold Cup Championship. Games begin Friday September 16th, with Oman taking on Philippines at 1930 hrs, Mega ice.